Plot: When Hiccup discovers Toothless isn't the only Night Fury, he must seek "The Hidden World", a secret Dragon Utopia before a hired tyrant named Grimmel finds it first. Starring: Cate Blanchett, Gerard Butler, Kit Harington, Jonah Hill. 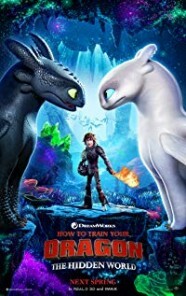 distributed by Universal «How to Train Your Dragon: The Hidden World» in the US movie theaters released on February 22, 2019 and has grossed over $509 million worldwide; dvd and blu-ray release date was set for May 21, 2019. Rent from Netflix and Redbox from May 21, 2019. «How to Train Your Dragon: The Hidden World» in the UK released in movie theaters on February 1, 2019. The movie estimated to release on dvd and blu-ray some time in May or June 2019.